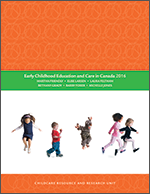 This report provides a snapshot of Canadian ECEC in 2012, the year for which the most recent reliable data are available. It is the first in a series of reports, policy briefs and commentaries produced by the Moving Child Care Forward project funded by the Social Sciences and Humanities Research Council of Canada's Connections program, a joint initiative of CRRU, the Centre for Work, Families and Well-Being at the University of Guelph, and the Department of Sociology at the University of Manitoba. This report uses consistent data regularly collected by CRRU as a base and integrates other pertinent data. It outlines key trends, patterns and policy shifts in Canadian ECEC's organization and governance: the demographic context, child care spaces, public funding, parent fees, integration of care and early education, ownership or auspice, Aboriginal child care, human resources and unionization. The Moving Child Care Forward project's documents and other initiatives will be found at movingchildcareforward.ca (coming soon). Sign up for CRRU's e-news to be alerted of the website launch. The next version of ECEC in Canada, CRRU's regular synthesis of ECEC data on which this report is based, will become available in 2015.